Catching child predators? There’s an app for that, and it’s expanding its reach to Android smartphones. 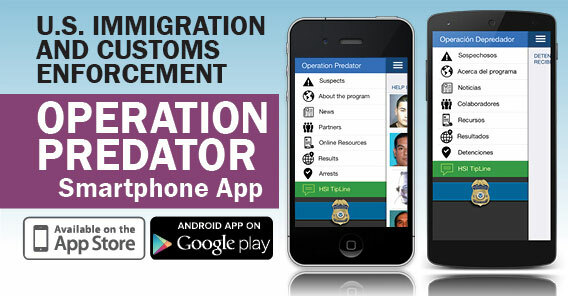 Operation Predator—the first U.S. federal law enforcement app designed to seek the public’s help with identifying and locating fugitive and unknown suspected child predators—is now available for both Android and iOS-based smartphones, and also features built-in Spanish language support. U.S. Immigration and Customs Enforcement’s (ICE) Homeland Security Investigations (HSI) launched the initial Operation Predator for Apple products in September 2013. Within 36 hours of its launch, the app helped HSI special agents apprehend a suspect. The latest versions of the app are expected to significantly increase public outreach to help locate child predators and rescue their victims. The Spanish language versions of the app are built-in to the iOS and Android applications and require no additional downloads. to view news about arrests and prosecutions of child predators. The app also provides additional resources about HSI and its global partners in the fight against child exploitation. The iOS version of the app can be downloaded from Apple’s App Store and iTunes; the Android version is available on the Google Play store.